Paging through the latest issue of Drawing magazine, I found a good drawing of a house and used it for the basis of this drawing. 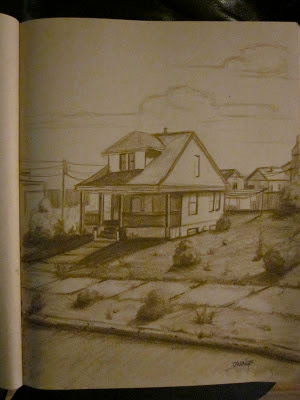 The whole setting in my drawing is different as are some of the house details. These types of house, mostly build in the 20's and 30's are very representative of the homes in my older neighborhood. These houses tend to have more character than the houses being built today and often times the materials were better. For example, our old home, which was very similar to this one had 2" maple floors throughout the entire house. The thickness of the floor planks is 3/4" and they were solid. Labels: architecture, house, Pencil Drawing, sketch.